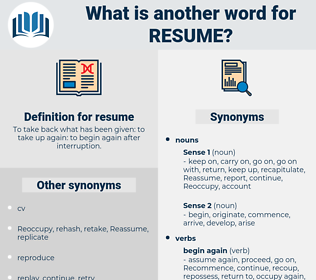 What is another word for resume? To take back what has been given: to take up again: to begin again after interruption. re-engage, vitae, relaunching, repeat, reopening. 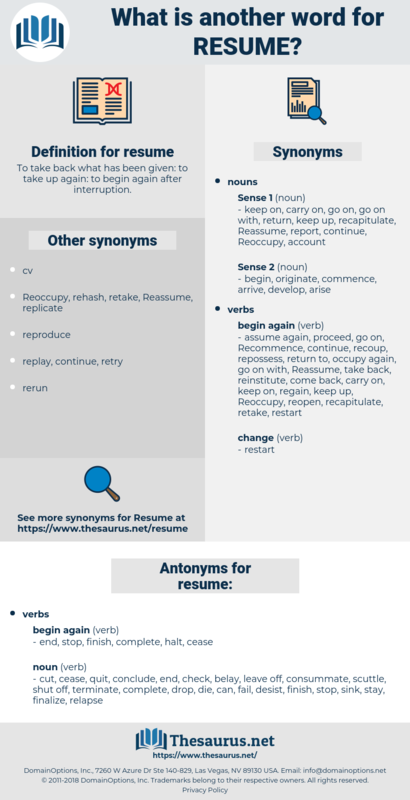 renew, reinstate, revive, re-start, regain, reclaim, retake, reestablish, rehabilitate, reinvigorate, reassert, revitalize, rebuild, re-enter, resuscitate, repossess, recapture, revisit, rejoin, re-engage, recur, retrieve, proceed, revitalise, reinitiate, rekindle, reproduce, restate, regenerate, reboot, assume, reconsider, reintegrate, recoup, replicate, jump-start, commence, kick-start, re-energize, rejuvenate, recreate, start, re-examine, withdraw, readmit, re-activate, paraphrase, normalize, rewrite, restore, repeat, re-instate, rebound, rediscover, catch, reiterate, reshoot, borrow. reopen, Re-open, re-establish, reconvene, re-launch, reconnect. end, stop, finish, complete, halt, cease. cut, check, finalize, drop, can, conclude, die, consummate, break, belay, desist, leave off, sink, terminate, scuttle, shut off, stay, quit, fail, relapse. And if you do not at once resume your seat, I shall be forced to ask aid of yonder priest." She turned away abruptly as though to resume her walk. reexamine, reason, region, recession, raw sienna, rose wine, recission, Rosa Canina, rescission, rhizome, Rosh Hashanah, raceme, ricin, rousseauan, rogaine, roughen, ruskin, racoon, reawaken, Rosh Hashonah, risen, Reggane, russian, rich man, racon, Rosh Hashona, reagan, rose gum, re-examine, re-assume, ryukyuan, raccoon, resin, rejoin, roughhewn, rake in, regime, racism, rough in, reign, reassign, raisin, Riesman, resign, reckon, resiny, regina, requiem, racine, rossini, regimen, rajanya, rosin, reagin, regain, Rosh Hashana. change, uphold, continue, carry on, preserve, bear on. assume, adopt, take over, take on.